When you're ready to try this at home, here are our tips. Try this at home first, in a place where there are no distractions. You’ll also need a longish lead and some tasty treats or a favourite toy to reward your dog when they get it right. Put your dog on the lead and ask them to “sit”. Then, holding the lead in one hand, walk backwards slowly, away from your dog, while telling them to “come”. If your dog follows you, reward them straight away with praise and a treat. Repeat this exercise several times. Once your dog has got this first step sorted, then you can try varying it. Instead of continuing to walk backwards, crouch down, open your arms wide and give your dog the “Come” command. When they reach you, reward them with lots of praise. Once your dog responds reliably to this command, then you can try the exercise without a lead, and in different areas of the house (sticking to places with no distractions at first). 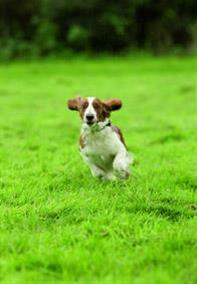 The next stage is to take your dog outside and continue the training in a safe, enclosed area, off the lead. It could take several weeks or even months until you’re confident that your dog understands the command. When you get to this point, move on to working outside, without the lead - as long as you are in an area where it is safe for your dog to be off the lead. Always end each session on a high note so that your looks forward to the next one. If your dog just isn’t getting it, try moving backwards one step and reinforcing that stage some more. Watch your tone of voice – even if you’re frightened that your dog might be about to race onto the road, your command has to sound bright and encouraging. If your dog hears you being panicky, frustrated or angry, they’ll only get confused. Try not to scold them for not coming on command, but praise and reward him every time they get right. 2. Are you practising in different situations? Sometimes, your dog will simply come back because they want to be with you, not because they understand what you’re saying! Train them to understand your command in a wide variety of settings and situations, and whether they can see you or not.